David Hughes says the book, "Shake Hands With the Devil" changed his life path. Hong Kong, China (CNN) -- The way David Hughes tells it, his life was humming along nicely on a normal, if a little dull, career trajectory. Born and raised in Hong Kong, Hughes worked as a surveyor, traveling to petrol stations in the United Kingdom. All that changed when a friend loaned him the book, "Shake Hands With the Devil," by Romeo Dallaire, the Canadian statesman, author and retired general. The book follows Dallaire's time overseeing U.N. peacekeeping forces in Rwanda during the 1994 ethnic strife that claimed an estimated 800,000 lives. Hughes says he couldn't put it down. It affected him so much that the following day he quit his job and moved to Rwanda to work as a volunteer. Hughes has always had a passion for rugby; he plays for the Hong Kong University rugby football club, so when he saw some youngsters playing rugby on his way to work one day he was struck by their natural talent for the game. He knew he had to find a way to bring them to Hong Kong. Fast forward two years, and the first Rwandan national team, The Silverbacks named for Rwanda's mountain gorillas, will make their debut at the Kowloon RugbyFest: a 10-a-side tournament which features teams from around the world. Hughes put the trip for the team together, taking on the task of fund-raising. It is the first trip outside of Rwanda for the athletes. Hughes spoke with CNN. CNN: First of all, what made you decide to bring the Rwandan rugby team over to Hong Kong? 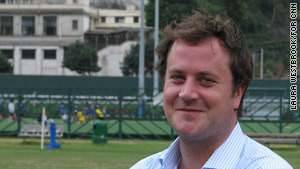 David Hughes: I was living and working in Rwanda, when I came across some guys playing rugby, decided I wanted to get involved with a rugby team there and it was immediate that some of these guys had real raw talent and were naturally very able and I thought if we could put some of them in front of the international rugby community then it would really benefit Rwanda rugby and put a real focus on Rwanda rugby. CNN: Are the Hutus and Tutsis in the same team together? DH: I would imagine so but to be completely honest, it's something I have no idea about. I've never asked them. CNN: It isn't an issue? DH: No, absolutely not. It's something they've put behind them. And playing with these guys, I have absolutely no idea who were originally what tribe and they've got no intention of telling me. CNN: How has the government been? DH: Fantastic. The minister of sports over there, Joseph Habineza, is a wonderful guy and he's on board. At the moment there is no budget for rugby in the Rwandan sports budget so there's no money from the government. What they are helping with now is getting the passports together, none of my players have passports and that's quite a lengthy process in Rwanda to get passports. So they've helped with that. They've been supportive but I'm hoping this tour will go well and next year they'll put some money into the budget. At present there is no dedicated rugby pitch, there's no rugby posts in Rwanda, no tackling bags there's one scrum machine that's broken. Everything about Hong Kong is polar opposite to Rwanda, and you may as well be flying to the moon for these guys. CNN: So how are they preparing to come over to Hong Kong with these limited facilities? DH: When I first got there, a lot of them were training barefoot. They would play in just a pair of tight shorts. Some guys would play in jeans and sweaters because they didn't want to get cut on the pitch. They're training six days a week at the moment. They'll certainly be the fittest guys in this tournament. They're very fit, very willing. Some of them are traveling huge distances every day to train in conditions which for anyone who's playing rugby in Hong Kong would think are very poor. CNN: What's been the most rewarding thing so far? DH: I guess the most rewarding thing is I've had the guys calling me up, very brief phone calls -- a lot of them don't speak very good English -- saying they've been selected on the team and they're just completely ecstatic, they've been training for two years, and even when I was there last and I was speaking to them and I was saying look you're coming to Hong Kong they didn't believe me. They've had a lot of broken promises, these guys, in their lives and they don't really believe anything until it's done and when they saw the tickets were booked and they were going to the government offices which for some of them is a privilege to go into, to have their photographs taken for passports, some of them never thought they'd ever have a passport. It's going to be phenomenal to see their facial expressions when they get to Hong Kong. Everything about Hong Kong is polar opposite to Rwanda, and you may as well be flying to the moon for these guys, so the real reward will be then and hopefully them winning some silverware at the tournament. That will be the biggest thing for them. They won't be here to socialize. Everything will be interesting in Hong Kong but their main goal -- and they're so driven -- is to win something. They're rugby players, they want to win. CNN: Do most of the players live below the poverty line? How is this trip going to impact their lives? DH: The actual players that are coming on this tour, most of them don't live on the streets. Some of them live quite rough -- very, very rough for our standards. When I was last there, three or four players pulled me to one side and said they were really struggling with accommodation and I think these guys often do find it hard to put a roof over their head all the time. But rugby can help the street kids, the kids that are really desperate, and none of those are coming because they're just too young. When I first got to Rwanda, I was pretty amazed how they don't trust anyone. Trust is such an issue for these kids. A lot of them are orphaned by the genocide, living on the streets, a lot of them went to church schools and there's been a lot of sexual abuse in their lives. When they're living on the streets, life's tough and the only people they trust are the people around them. They've had a lot of broken promises, these guys, in their lives and they don't really believe anything until it's done. The fact is they don't trust anyone, they don't want to go to a boarding school somewhere, so I see rugby as hopefully an opportunity where they can build that trust, they can turn up, they can meet other players, they can learn leadership skills, controlled aggression that you need in rugby, and slowly they can build relationships and realize there are people in this world that are nice and giving and they can be friends with them outside of living on the streets and maybe they can rub shoulders with a kid who does go to school and they can go to school with them for a day or two and see what it's like and slowly build that trust in humanity again. It seems odd that rugby can be that tool that can get them to gain trust and get them back into education, hopefully. CNN: It's an incredible achievement, getting them here to play in the Kowloon RugbyFest. Do you see them being able to play in the Hong Kong IRB International Sevens tournament? DH: Yes, it's a big step forward and it's going to take them a long time to bed in and do this year in and year out. But I see no reason why. The Hong Kong Sevens is still an invitational Sevens. The key is funding if we get money to send back to Rwanda, to get them a pitch, to get them a clubhouse, to get them IRB-certified. I mean there's a long way to go but I see no reason why with the right training and funding they could be in the Hong Kong Sevens in five to 10 years time, realistically. These guys are naturally quick, agile, and understand the game really well. With the right coach in for a year and the right money I see no reason why they can't excel really quickly. CNN: What's been the most unexpected part of this process? DH: How much support there is now. Just these last few days we've had three or four corporate sponsors come through wanting to put their names on the shirts, give donations and speaking to some of the major banks in town about sponsoring the whole trip next year. If one bank can step up and say here's US$40,000, we'll do the whole trip then other fundraising from individuals can go into developing rugby in Rwanda. That's been the biggest surprise for me was suddenly so many people have come on board, random people in Hong Kong who I've never met before just sent me an e-mail saying "Dave I read your article I think it's fantastic" and donated a thousand dollars U.S. online. It's phenomenal.